I've been starting to get a bit more adventurous with some recent home brew recipes and this post tells the story behind one of the whackier things I've brewed thus far. The result was surprisingly good for what started out as something of a joke following some banter, probably over a year ago now, with Gregg Irwin of Weird Beard. 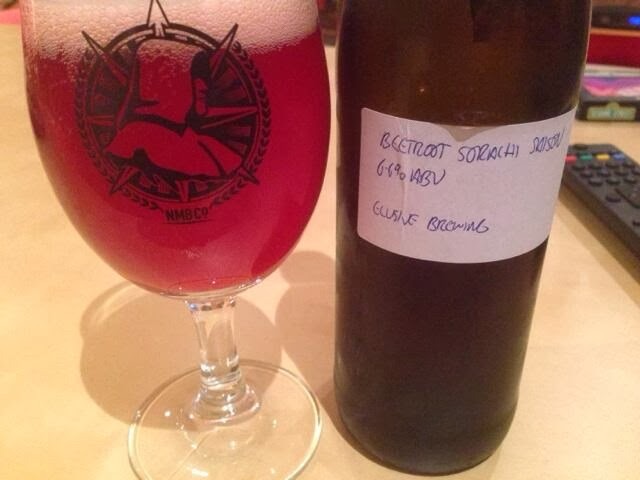 We joked about brewing a beer with beetroot. I recall Gregg fancied brewing a stout, which I reckon is an interesting shout. At the time, I was crazy into Saisons so that's all I could think about. Absolutely MUST be pink or purple - why waste all that wonderful colour!? 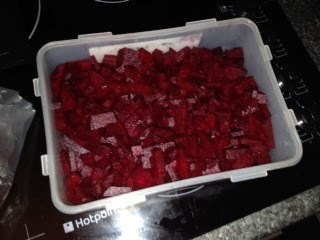 The brew day started with peeling and dicing two whole bunches of fresh beetroot and weighing out what was intended to be a super pale grist, in order to allow the deep red colour of the beets to come through in the finished beer. Primary fermentation went to plan, although given the cold weather and subsequent ambient temperature, I had to sit the FV on a heater plate for the last few days. Sometimes even Wyeast 3711 needs a hand! Curiously, by the time primary was done and the yeast had dropped out, the beer was back to being a lovely pink colour - result! I'm no scientist but am guessing the colour fading during boil was some kind of something doing something or other and that something or other then undid itself as the yeast and proteins dropped from the beer. Yep, that sounds perfectly reasonable. A modest dry hop, cold crash and transfer later and I was ready to bottle. I primed the beer partly with beetroot juice to add a bit more colour and beetroot flavour into the mix. The bottles were then left to condition for 2 weeks and eagerly shared around to await feedback. Strangely, people seemed to like it - even those who don't 'do' beetroot. The sweetness and earthiness is certainly there to taste but doesn't dominate. The Sorachi Ace is also noticeable both in the aroma and flavour but given the low hopping rates, also doesn't dominate. 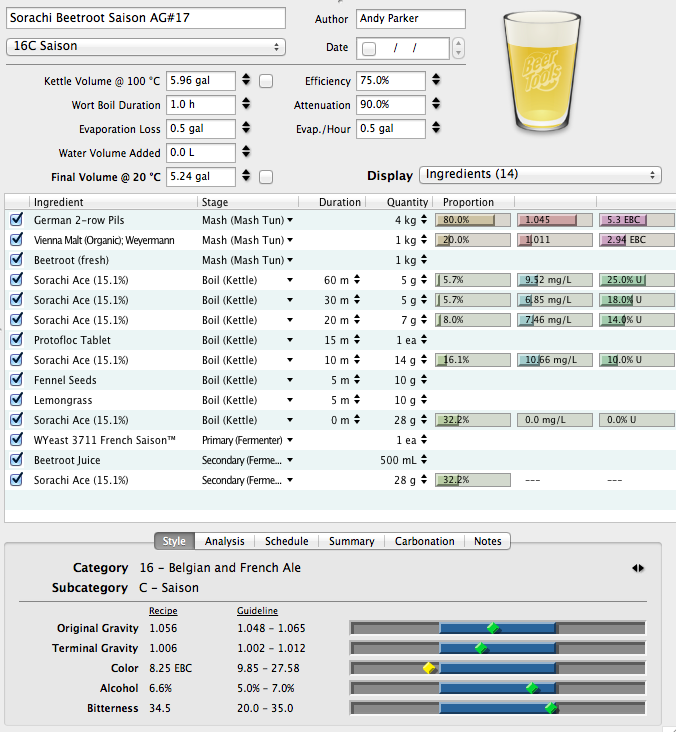 Perhaps surprisingly, the beer is undeniably a Saison. A slightly bonkers one, granted, but very drinkable and ripe for a food matching (any ideas - post below!). Oh, and most importantly, it's PINK, yeah! If you've a bottle spare I'd love to try! Have a handful of Irish beers to give you next time I see you anyway. Hey Steve, I'll put one aside for you and figure out logistics later! Now that's a great shout! Just curious as to how you came about the 500ml of beetroot juice that you added in secondary? Did you boil up some beetroot and strain the juice or did you buy it? Hi Taf, that's actually a typo as I only added 250ml. It was a bottle of shop bought juice. Beetroots contains a lot of sugar, so it must have influenced your OG... Do you know how much gravity did it increase?